My Xbox Stats appear on Companion as well as BAttlefield Tracker. 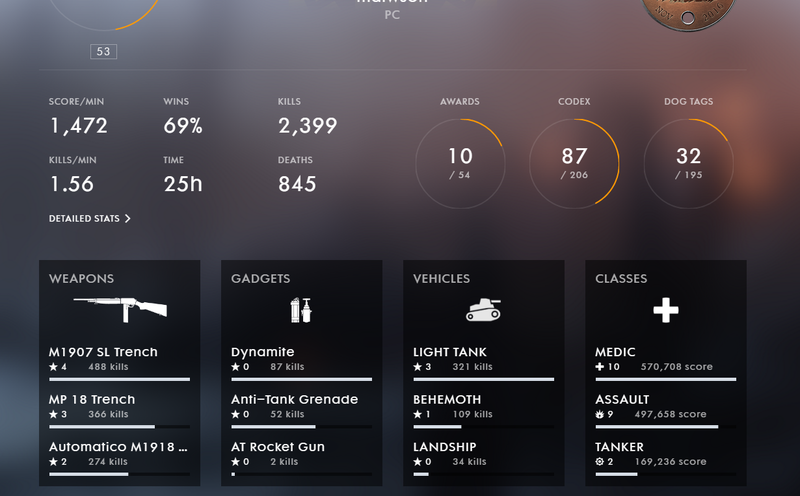 Is there anything I need to do to expose my stats for Bf1stats to read my stats? OK. I can view my profile right now, but some stats are wrong (K/D ratio, Kills per minute completely wrong). My real kill count is 8061 but, it's show 7661. Why is it not count my 400 kills? I've tried logging into companion then bf1stats.com. Still no change. Game time is about 50 hours too high and I have negative 2449 unknown kills. The unknown kills is our own calculation (allWeaponKills+allVehicleKills-kills). But kills and deaths are reported by an API from EA. I don't know why there is a difference between companion and the API we use. The problems with total playtime and "unknown kills" would affect SPM and KD. I have good news. The kills should be fixed with your next stats update. The time will be fixed later. We are displaying the whole play time including menu idle currently. Soon I will switch to the real multiplayer play time. I switched now to display the multiplayer play time after your next stats update. So just play a round and update again. with the new stats update, the play time still can't possibly be right. I have more time using weapons alone, not even including vehicle time, than my supposed total play time!.. How would this be possible? Also could we get both times so that we can also tell how much of our life has been spent playing as well as our actual time in play? I have been coding some bf1 graphics. Can someone tell me how to code a cirkel progressbar?? Only the stats.score of TDM is not working! There is only no choice between a Fancy or a Lineart image. Last edited by Dr_Twinkl3s; 2017-03-30 at 00:46. Thank you guys somuch for sharing this. When is the API going to be opened up? Why are there no stats for the hellriegel defensive? Other level 10 weapons are listed but not this?